Halloween may be long gone but there's nothing wrong with sporting a chic pumpkin clutch this winter. 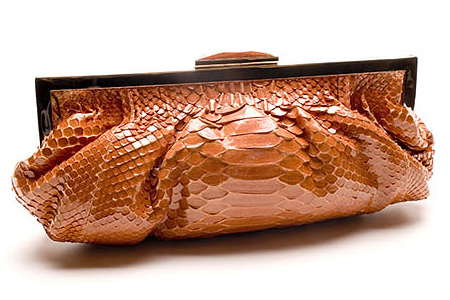 This sleek cobra beauty by Dania Reiter is a simple, understated clutch with a striking orange color, gathers, and a jeweled closure. Reiter's background in jewelry design is evident in the detailing in this bag. Though oversized clutches are what’s in this year, Reiter's clutch is a timeless beauty, both in color and style. What a jewel!